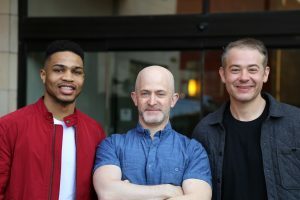 I met with director Nick Budabin and star Keifer Sykes, of the new documentary Chi-Town (which I also reviewed), on Monday, March 12, at the 2018 SXSW Film Festival. The film, which follows Sykes from the end of his high-school basketball career through the end of college, and just beyond, is like a sequel, of sorts, to the great Steve James’ 1994 Hoop Dreams. Where that movie focused on two different characters, Chi-Town (pronounced with a soft “sh”) hangs its narrative fortunes squarely on Sykes’ capable dramatic shoulders. Both Budabin and his subject are up to the task of holding our attention for the film’s brief 82 minutes, crafting a story that is about much more than basketball (though it is about that, as well). We return, time and again, to Sykes’ hometown of Chicago, where the people he grew up with suffer through the violence and crime that plagues the place. This is life, as seen the prism of an extraordinary human being’s point of view. Here is a condensed digest of our conversation, edited for clarity. Hammer to Nail: So, let’s start simply. How did you two meet? Nick Budabin: We met because I was looking to film characters around the Chicago high-school basketball scene, and there was a game that Keifer played in that was an All-Star game. It was being put on to support a group against violence, called “Purpose over Pain,” that’s made up of parents who have lost children to gun violence. Keifer was one of the players in that game. We were filming a bunch of different people connected to that game trying to tell a large story about Chicago and basketball and the intersection of gun violence. We filmed for a few years with a few different characters, but Kiefer kept being amazing and being cooperative with the filming process. So, that’s how we met, and we just continued filming, for years and years and years. HtN: Keifer, how old were you at that time? Keifer Sykes: I believe I was 16. NB: I think you might have just turned 17. ‘Cos it was January of 2011. KS: Yeah, so I just had turned 17. HtN: And there’s footage in the film from when you were 17. So really, Nick, you used that early stuff in the movie. HtN: Of course! Keifer, how old are you know? HtN: So that’s a seven-year process. Are you both big fans of Hoop Dreams? NB: I’m a big fan of Hoop Dreams, for sure, both as a filmmaker and a lover of good movies. HtN: Yeah, I mean, it’s not only about basketball, but about Chicago, and more. Did you consult with Steve James on this project? NB: (laughs) I did not, actually. I met him one time and I told him about the film. I didn’t totally know that it was going to be this film, yet, so I probably described it in a confused way, but he was super nice. I was always a huge fan, but I feel it’s almost 25 years later now, and I think there are so many other stories to be told about Chicago, so it’s definitely been an inspiration for me, but I also wanted to…You know, one of the things about Hoop Dreams is that it takes you through high school, and for our film, we started at the end of high school, and filmed for the same amount of time, but a different stage of life, and so, that was really important, to show that side, as well. KS: And it’s cool that it’s interconnected with me going to Marshall [John Marshall Metropolitan High School, one of the schools in Hoop Dreams] and Arthur Agee [one of the subjects of Hoop Dreams] going to Marshall. So, when they started filming me, that’s instantly the thought I had and the vision I had: “Oh, this is going to be my version of Hoop Dreams.” Because, growing up, seeing Hoop Dreams, and then deciding to go to Marshall, I was, like, “Oh, I hope I have a movie one day.” And when this happened, it was all kind of interconnected with the Marshall/Hoop Dreams inspiration. HtN: Cool! So, we’ve established that you shot and edited the film for 7 years, Nick. When did you decide to stop filming and finish the movie? NB: Well, I think, luckily for us, Keifer was working towards a very clear goal, which was the NBA, and there’s an NBA draft. And what we learned as we went is that, well, first you think the NBA draft is going to be your ending, eventually. But for Keifer, his journey took so many twists and turns over that summer after the draft that we were definitely all in over whatever was going to happen next with him. We also knew, however, that is was only going to be 4 more months until he knew where he was going to land as a professional basketball player. So, once we saw where that went, we knew that we had an ending there. But, for years, it wasn’t clear, it’s just that we knew that his journey would have an ending. HtN: Keifer, are you still playing in Korea? KS: This season, I’m playing in Turkey. Last year, I played professionally in Korea. And my first year, I played for the [San Antonio] Spurs and was cut, and was assigned to their development-league team. So, yeah, those are the places I’ve been in my three-year pro career. HtN: Well, at least you’re getting to travel, even if that’s not what you imagined your pro career to be. I’m sure you’d like to stay in one place, but maybe you like the wandering. KS: It’s definitely an interesting part of the journey. In college, you’re pretty much stuck in one school, unless you transfer. Starting out, in the film, I was just, like, “I hope I go to the NBA, I hope I take it as far as it can go.” And actually, I was naïve to think I could just become a pro basketball player like that. So, these past three years, going different places, going through the NBA process, without someone like my father or someone I’m familiar with, who is familiar with the process, was all fresh for me. You know, picking agents, getting a new agent – you know, Nick put a part about selecting an agent in the film – going through all that has been a part of the journey and experience, as well. Hopefully I can still land in the NBA. You know, that’s the goal, but I’m enjoying each part of the moment. It’s definitely taking its twists and turns, and it’s been a hell of a ride. HtN: How about your family? Your girlfriend and…two kids now, right? KS: Yeah, we have two kids. I’m still single now. I’m not married to her. Yeah, so the thing about my journey is that it’s taking me so many places, and now my kids are growing, and they have dreams, and with me still trying to chase my own dreams at a young age – because I had kids at a pretty young age – it’s crazy. Balancing everything and balancing life, sacrificing love and sacrificing family, sacrificing everything for them to have a better life. I have this vision for my career and my future, and for my family, and for a lot of people in Chicago, as you can see, as we continue to keep going. It’s a lot to handle, and I just try to handle it to the best of my abilities. HtN: Sure. So, what were some unique challenges in the making of this particular film, for both of you, in terms of footage that you might have wanted to shoot, but couldn’t? Perhaps something that was too personal? Granted, that’s a challenge faced by all documentarians, Nick, but what were challenges unique to this film? NB: There were a bunch. One was just footage, itself. A lot of the story we wanted to tell was Keifer’s relationship to his high-school teammates, and to connect those earlier years to the later years, when tragedy happens to some of them. But we didn’t film with Keifer and his high-school teammates in high school. We filmed with Keifer, but we just didn’t get to meet those other guys. So, we relied a lot on archival footage. Fortunately, when Keifer played at Marshall, they went to the playoffs a bunch, and they had a lot of high-school footage that we were able to use. But it was tough to put those pieces together. KS: Well, for me, I just wanted good representation of my family, myself, my friends and everybody. You know, people always had good things to say about me, but they don’t have a lot of good things to say about the city. With the characters that we had in the film – you know, my friend getting shot and my coach getting shot – it was good for people to see that. Things happen to people who are not always doing negative things, to someone like my coach, or my teammate. These people are just living their regular lives, and just dealing with life, and sometimes it will hit them and leave them paralyzed, literally. So, just to represent all that well, like how they put my best friend, Levon Carter, in there, I think, was great. Because, even though he did something that we see as a mistake, that was his first mistake, and they put him in prison for a long time. And I know people will probably say, “Oh, that’s your friend. Why do you hang with negative people like that?” But they don’t understand that this is a kid who was just abandoned: abandoned by his family, abandoned by his parents; his father’s in jail, his mother’s on drugs, and he has to just figure out life as he goes. So, it was good to show that and bring it all back to the kind of support I had. You know, two parents, and support, kept me focused. Those things make a difference, and so I think they did a really good job of piecing it together. HtN: I agree that the film does a really good job showing everybody’s story. So, Nick, since you talked about the challenge of gathering footage…you shot the film for a number of years, and over that time, technology changed. Sometimes it feels as if, every day, there’s a new camera that comes out, with new codecs to worry about. What were some of the technical challenges of managing that, and changing cameras over the years, and reconciling it all in the editing room? NB: So, I will say that the technical side of it is not my strongpoint, but … we started shooting with the [Panasonic] HPX170, which is a small, portable camera that people don’t really use anymore. HtN: I used to own one! NB: Yeah! OK, I can speak to this. So, it was tricky, because we started filming with that camera, in 2011, because it did well in low-light situations, and we were going to a lot of gyms that maybe didn’t have the best lighting, and also, my DP [Director of Photography], Matt [Elkind], was doing sound, as well. Basically, our goal was to be a fly on the wall, and it’s a really small camera, you could go into a gym without people being, like, “That looks like a film crew.” I would really just disappear into the crowd, watch them play, then let Matt kind of movie around the gym, and he was very unobtrusive. The challenge with that was that we didn’t own the camera; we never bought one. So, over the years, they were getting harder and harder to find, and we would have to get some friends who would let us use them. I was very DIY; it’s not like we had a whole stockpile of cameras. But then Matt bought a RED, and he had a [Canon] 7D. So, we’d go back, and we’d realize that because we were shooting on this almost lo-fi look with the HPX, when we did throw in the RED footage and 7D footage of Keifer playing basketball, it would stand out in a way that felt theatrical. And so, that contrast, I think, really helped us. It wasn’t all this glossy image, so when it is, you’re drawn in a little more. It was really fun to play with all those media and figure that out along the way. HtN: That’s great, and does explain the different looks, throughout the film. KS: Yeah, and that was something that was cool for me to see, as well. Like he said, he shot the original footage, of my dad and my high-school games, with a small crew and a small camera, and I thought it was going to come out all grainy. So, it was interesting to see how it all came out, because it would just be us three, with a camera, filming a documentary, so to see it on the big screen yesterday, so clear and clean, and pieced together so well, was amazing. I remembered that at this moment, we had a small camera, and at that moment, we had a nice camera, and they might ask me, dribbling in the gym, to do another take, and another one, until we get the right one, so I was wondering, “How will this finished product look?” And it just came out great, man. NB: Yeah, I think it’s a testament to the fact that anybody, if you have a camera, can go out and do it, right? My DP and I work in television in our day jobs, so we’re used to traveling with, like, 10- or 15-person crews, with 3 or 4 cameras, and a mixer, and a lot of support, but we wanted the opposite experience of that, and it ended up being a huge benefit to us. There’s a producer on the film, Terrence Elenteny, who, a lot of times if I couldn’t be at a shoot, he would just go, by himself, with a camera. And even that was better, in some situations, because with just one person, you completely disappear. I think it can be a real asset to have a small team. HtN: Sure. It’s all about knowing where to put the camera, when and why, more than it is about what the camera is. HtN: So, Keifer, I have one final question, about your height. It comes up, over and over again, even though you are a phenomenal basketball player. Who cares, right? But I heard three different heights in the film – 5’10”, 5’11” and 6′ – and so I left the film wondering, “How tall is Keifer?” So, how tall are you? KS: (laughs) So that’s the thing. In basketball, you want to try and get every inch. HtN: OK! If, for professional reasons, you can’t tell me, I don’t need to know. KS: No, it’s fine! I’m 5’11”. But at the end, when you go into the NBA, I wanted to be at 6′. So every time, I’d be, like, “Make sure you put it at 6′.” You know, basketball is a big man’s game; it’s not a little guy’s game. You know, at 6′, that changed things. Even that one inch. Me being on the border all my life, when someone asks me, “How tall are you?,” I wonder, “Should I tell them 5’11’ or 6′?” So, yeah, that’s something I always deal with. It was cool to see that come up, as that is a constant in my life. HtN: Yeah, it didn’t bother me at all, I was just wondering how tall he really is. Well, gentlemen, congratulations on the film. I really enjoyed it, and I hope as many people as possible get to see it. NB: That’s awesome. Thanks a lot!